One of my favorite things to do when I receive a new book from publishers via Netgalley, is to hold off rereading the summary of the book until I actually start reading it. It gives me the opportunity to be completely surprised by a book. This was especially enjoyable with The Forest Queen, as I had the chance to read through the book and piece together that this story is a retelling of the Robin Hood, but with some unique twists and turns. Robin Hood is one of my favorite stories so once I realized what the book was about, I was really excited to see it through to the end. The writing and descriptions in this book was absolutely beautiful. From the opening paragraph to the epilogue, there are great descriptions of the landscape and setting of the book. I especially loved the scenes about how Sylvie and the others developed their new life in the woods, hunting, fishing, and creating their home. I don't get read a lot of "survival" stories in my genre so I enjoyed delving into that aspect of the plot. The main character Sylvie, is a strong-willed girl who wants badly to affect change although she comes from a place of strong privilege. She goes through a number of internal conflicts through the plot, and has a lot of obstacles to overcome. I enjoyed seeing her develop and also enjoyed her chemistry with the other character, particularly with Bird. Bird was a fun character to get to know and while he's the love interest for Sylvie, he's also her foil character, and opposes her at almost every turn. There were a lot of characters in the book, but I didn't feel like many of them were fully developed or necessarily memorable, other than Sylvie and Bird. This plot had a lot of promise. Everyone knows the story of Robin Hood, but with the role reversals in this story, I looked forward to seeing a new face on the original tale. There were definite moments when I was invested in the story and the plot was fast moving so the book was a quick and easy read. I was disappointment with the end, though. Many plot points were introduced to the story but nothing ever became of them. It made me wonder why they were brought up in the first place. The book was also very short, I felt like the author could have drawn the story out a bit more and done more with those plot points or make the story more complex. 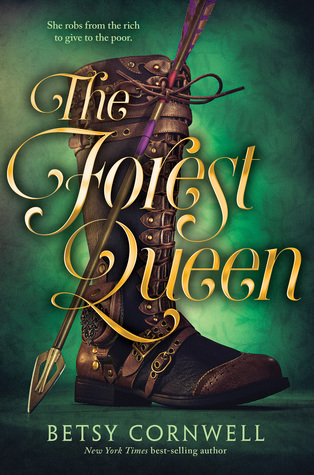 The Forest Queen by Betsy Cornwell is a great book for you if you love the legend of Robin Hood and enjoy reading gender-swaps or role-reversals. The book was a quick and easy read. I felt compelled by the plot and loved the descriptions, but felt like the characters could be more developed. The ending was somewhat disappointing, but will be great for casual readers. There are dark and sexual elements to the book, so I recommend it to the higher age group of the YA audience. The Forest Queen will be available August 7th, but you can pre-order the book now via Amazon, Barnes and Noble and your local bookstore.